Behind the Bit: Horse owners: Care for a sedative? 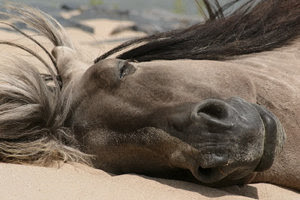 Horse owners: Care for a sedative? For your horse, that is. I've noticed that sedatives vary in the degree of sedation, the length of sedation, and other properties. As a yearling, Riley was having a snit when I tried to braid him, and acepromazine did nothing. Ace was more effective for post-stall rest handwalking/turnout, but in the face of a newly stimulating environment you could see him "fight through it." Someone told me that it basically just lowers your horse's blood pressure (this may be a bit oversimplified). I scored some Xylazine (Rompun) for bandaging Riley's hoof after his surgery. It worked much better as far as sedation, producing a mellow, lightly dozing horse. Compared to Ace, it's short-acting and it affects coordination more. Administration: Can be administered IV, subcutaneous, or IM. IV administration takes effect in 3-5 minutes, while IM takes about 20 minutes. Uses: it is an alpha-two agonist that induces moderate sedation, muscle relaxation, and analgesia. The analgesic effect is shorter lived than the sedative effect. Dose info: Increasing the dose does not increase the sedation but can increase the duration. In higher doses, it may cause slight muscle tremors, heart rate slowness/decreased output, and reduced respiratory rate. Blood pressure may rise temporarily and then lower. Horses may still react to auditory stimuli. Movement in response to sharp auditory stimuli may be observed. Has a negative effect on gastrointestinal motility depending on the dose and frequency used. Accidental exposure to a single drop of xylazine can result in respiratory arrest in humans Avoid contact with mouth and eyes. Use with care in old horses, horses that are in shock, or dehydrated, or that have heart issues. Administration: IV, subcutaneous, or IM, 20-30 minutes to take effect in either case. Oral administration requires 45 mintes to take effect and results may be inconsistent. Use: mild sedation, no analgesia. In small animals, used for its anti-anxiety properties. Dose info: Increasing the dose increases the sedative effect, but sedation is light and animal can be easily aroused. I learned a great deal just reading the articles I found via Google, and one thing I learned is that sedatives must be selected with the individual horse in mind -- age, sickness, desired sedation and a lot of other factors have to be considered. The disclaimer, of course, is that your VET is the person to consult about sedating your horse. Only a vet can provide information on safe administration for your horse. I've seen a few horses actually get more excited with tranquilizers. Finding the right one and the right dosage can be tricky. Sounds as if you research has paid off with Riley. Very nice information. Xylazine is my vet's drug of choice when doing cultures on the less cooperative broodmares. It is incredibly potent, that's for sure. I only keep Ace around the house, I have to admit I'm pretty terrified of something that can cause respiratory arrest with a single drop! Another tranq that I've had experience with is Ketamine (sp?) which the vet attempted to use in placing a cast on a pregnant mare. The mare had an insane reaction to it, tremors and panic. We ended up having to put the cast on with the mare standing! Ok - I shouldn't have a middle school sense of amusement over serious medical stuff. But in my defense, I haven't had my caffeine yet. Have you ever considered actually *training* the horse rather then drugging him? Ace-ing a horse for braiding is insane. The horse has been having his foot wrapped for months, ever think that it might be a good idea to teach him how to stand still? I'm not sure what to say, anon. As a yearling, it was hard to get him to stand for 45 minutes at a time while I fiddled with his mane, by myself. very thorough. I had no idea Ace could cause that reaction in people. Thanks. I too believe in training, training, training, but I also recognize there is a time and place for sedation to be useful and positive. I'm not sure one can teach a suffering or traumatized horse TO stand still for treatment, for instance. Much kinder to sedate. I would sedate in a heart beat to wrap up Riley's hoof after surgery. I've seen ace used to help with braiding, then the dosage gradually dropped or stopped, and the horse has learned braiding is relaxing...not saying it happens like that all the time, but to be fair, I don't think we can say "no sedation in any situation except dire emergency". Jane, I can see a little of myself in your comment about owners needing sedation! In Riley's case, I fear mostly that he will get loose and run, or step somewhere unsanitary (bandaging). I think of that risk, and I think of his age (does he have the maturity to handle this), and then I think of the sedative. The sedative makes him safe, at a low risk. He's too young to be a pasture puff, and if drugs ensure he gets through this ordeal safely I'm inclined to go that route. Stacey I seriously doubt you are one of the owners who could use a little sedation (other than the normal reaction we all have when something happens to our horse: Ahhhhh - who has valium????). Given Riley's situation, I think you thought it through very well, and made the safest, kindest, most pro-active choice. It's one I hope I'd have the good sense to walk through and make if necessary! I've recently started following your blog - I really like it. I wanted to jump in and add (albeit late) that Xylazine will cause violent, dangerous seizures if a single drop is administered in the carotid artery, which runs very close to the jugular vein the farther down the neck you go. Also, Ketamine is not a sedative but an induction agent and a controlled substance that only veterinary professionals have access to. Blind Irish -- don't a lot of drugs cause big problems if mistakenly injected into the carotid? Wikipedia seems to say that ketamine can be used as an induction agent (anesthesia) and a sedative esp in emergency medicine. You are right - it's not ideal for any drug to go intrarterially. Flunixin and Phenylbutazone have a similar adverse reaction. We use Xylazine at the hospital (I'm an RVT) like candy, and it is a very common sedative, so the prevalence of a carotid stick is much more likely than with other drugs. I didn't see the emergency sedative on Wiki or in Plumb's Drug Handbook. Ketamine is a dissociative, which means that it creates a catatonic state in the user, causing hypersensitivity and panic like what Union Square described. That's why it is usually paired with a muscle relaxant after heavy sedation. (Xylazine then Ketamine + Valium) Granted, my experience is limited to an in-house setting and I am not familiar with a lot of the techniques that field vets use. Hope you don't mind me sharing opinions. I like reading yours.